"Cynthia Ann Greenleaf, Westbrook College, Class of 1973"
Westbrook College student Cynthia Ann Greenleaf, Class of 1973, was an Executive Assistant major and lived in Ginn Hall. 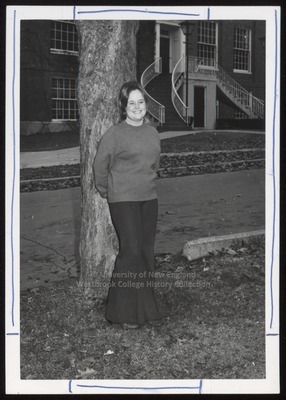 For her senior class candid photo, which appeared in the 1973 Tower Yearbook, she wore dark bell bottom slacks and a crew neck sweater. Her long hair was parted on the side and pulled to the back of her neck. Cynthia stands with her back to a tree in front of Proctor Hall.